I recall seeing this film for the first time when I was five years old. I also recall laughing hysterically at Martin Short, although I could not understand a word that came out of his mouth (and still cannot). 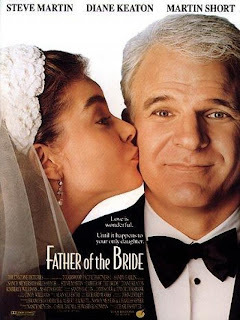 This sweet film from 1991 stars Steve Martin and Diane Keaton as George and Nina Banks. The cast also features a young Kimberly Williams-Paisley as Annie Banks, and George Newbern as Brian MacKenzie. Twenty-two year old Annie returns home from Italy to inform her parents that she is engaged to Brian. Nina is completely fine with this, although George is nervous. The film is basically based on his anxiety, as he narrates throughout its duration. Charles Shyer directs, who also directed the lovable film Baby Boom from 1987, also starring Diane Keaton. Shyer also produced the remake of The Parent Trap from 1998 starring Lindsay Lohan, among other films. The music is composed by Alan Silvestri, a name which many Disney fans will be familiar with. Silvestri composed the soundtrack for…wait for it...this year’s epic film The Avengers! He also wrote the music for fantastic films such as Captain America: The First Avenger (2011), The Polar Express (2004), and Contact (1997). And here is something rather amusing…Silvestri wrote the music for Reindeer Games (2000), which is a nickname Tony Stark gives Loki during The Avengers, a film which Silvestri provided the music for! Boom. Something which is intriguing about this film is that George breaks the fourth wall automatically. This can usually either make a film, break a film, or simply leave it hanging for the audience to figure out. For Father of the Bride, this actually worked as the narration provided the much needed comedy. Although this film is not of top notch quality, it is enjoyable and provides many smiles. The actors did an excellent job throughout the film. At one point, Annie explains Brian to her father…”He’s like you, Dad…except he’s brilliant.” This was an absolute laugh out loud moment. The actors’ chemistry was solid, and the plot line followed through well. The only thing I would have tweaked a bit is more screen time for Brian. His character was not developed more, and I feel they could have done more to enhance this. Thanks to IMDb, I found a few interesting facts to share. The character of George Banks was actually named after David Tomlinson’s character in the brilliant Disney film we all know and love, Mary Poppins (1964). George’s middle name, Stanley, pays homage to the original Father of the Bride film from 1950 starring none other than the amazing Spencer Tracy. My favorite IMDb fact is that Kimberly Williams-Paisley and George Newbern were featured as a couple in Hallmark Card commercials. I’m assuming this was during the popularity of the film. My favorite character in the film was Matty Banks, the son of George and Nina, played by Kieran Culkin. Although he was not in much of this, the scenes he did appear in were absolutely delightful and enjoyable. My favorite scene occurred toward the beginning when George pretended to accept the fact that his daughter was engaged, and he asked her to play basketball, which she did. Here she was, in a black dress and sneakers, happy as could be. This was a great moment between the two of them. I also love the fact that George had sequined white sneakers made for Annie to wear on her wedding day. I have never seen the original film, so I cannot compare. Father of the Bride brings me back to being a little girl and gives me fond memories. That being said, it is one I would enjoy having on in the background. However, it is not one which I feel the need to pay complete attention to. There is much which I enjoy about this film, but as I had said, it is not one of my favorites. Besides that, it is a sweet, lighthearted, family film which everyone should see at some point in their lives. Do you think it's enjoyable to get a phone call telling you to come down to the police station because your husband's been arrested for stealing hot dog buns?